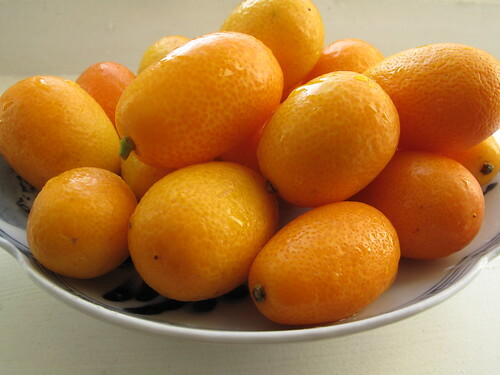 The kumquat is of the genus citrus Fortunella sensu stricto and cousin to other citruses – oranges, lemons and limes sensu lato. 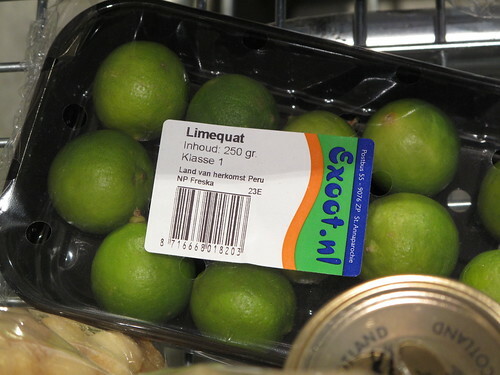 Its name might lure you into considering a friendship, if not familial bond with that other homophone of a fruit, the loquat but fear not, they have no ties that bind unlike its relationship with the limequats, a hybrid of key lime and kumquat. Let’s consider this yellow-gold to orange-fleshed fruit Citrus sensu lato. Small and often compared to the size of olives, these round – oval fruit vary in size, generally not exceeding 1 – 1 1/2 inches. Mine are much bigger than any olives I’ve come across in my lifetime. What do people like me find so endearing about the Kumquat? Its edibility. If you are a citrus fan, you would have considered many a time eating a fragrant blooming lemon – skin, pith and pulp. Sensibility would have gotten the better of you and you would have prevented your tongue from an acid wash and gone for what you needed – the zest or the juice. Not so Mr Kumquat. He is totally edible – head to toe – you might want to spit out the small, pectin-rich seeds rather than swallow but the choice is yours. Till I met a colleague at the coffee machine, kumquats in hand. He expressed delight for the very fruit and when I proceeded to talk about the pros and cons, he looked on …puzzled. Shocked at my elaborate eating pattern of bite, drink, bite, he said, I just eat it…all at once! Surprise, shock, amazement…especially when I tried it. Why, oh why do I have to make things so complicated for me? Why can’t I simply adhere to the KISS principle? The smooth skin is delicately pockmarked with a fine pattern of light and dark orange hues, with the dark, wet spots masking pores. A gentle squeeze results in the essential oils coming out of the fruit, sometimes as mere drops and sometimes as a spray. The skin is thick, housing pulp renowned for its juiciness and tartness. One taste and your system is shocked – yin and yang, bittersweet, fragrant and sour. The flesh gives easily to the bite and tastes somehow like a sweet orange but not quite.I find it refreshing and fulfilling, as though I have ingested the very essence of the fruit, wasting nothing. If you like citruses, you’ll love kumquats, and everything about them. From their flavour to their versatility, and their beauty. 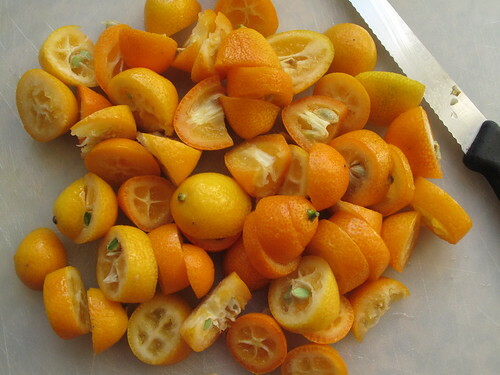 The three most prolific varieties of kumquats found in central Florida are the ‘Nagami’, or oval kumquat, the ‘Meiwa’, or large round kumquat, and the ‘Marumi’. The oval Nagami is the most common of the three. Although its skin is delectable, the pulp can leave the palate with an acrid aftertaste. A cold snap will sweeten it some. The skins, pulverized in a food processor and combined with sugar, cinnamon and ginger, make a delectable jam. 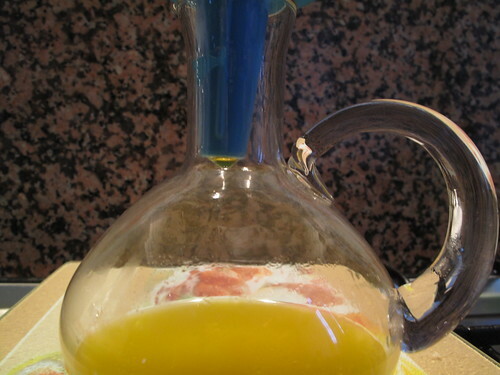 This method results in an oil that captures the fresh flavour of citrus. Look for fruit with thin skins – the more pith, the more bitter the flavour. If you can only find fruit with thin skins, see Chef’s Notes* . Orange is a knockout. Try Tangerines and kumquats too. 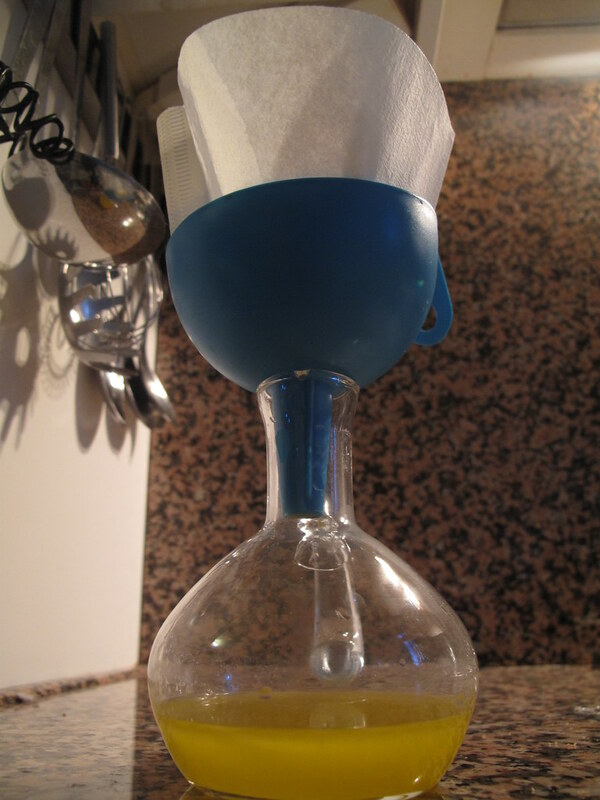 You can also make an oil with both an orange and a lemon though I prefer the clear flavour of the single fruit. I am a huge fan of ‘finishing condiments’, from salts to oils and vinegars and this recipe fulfils that itch to infuse something with flavour, to impart the essence of one ingredient onto another in a way that brings about perfect harmony.This oil is perfect on/in raw and cooked salads, as a dip for bread and much more. It brings with it a fresh, sweet and citrusy fragrance. 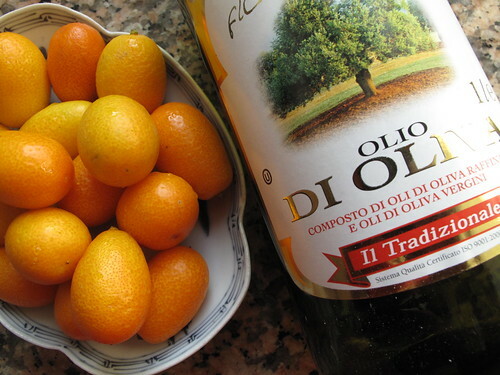 The original recipe calls for oranges, lemons, Meyer lemons or limes though Michael gives guidance on making the oil with kumquats. 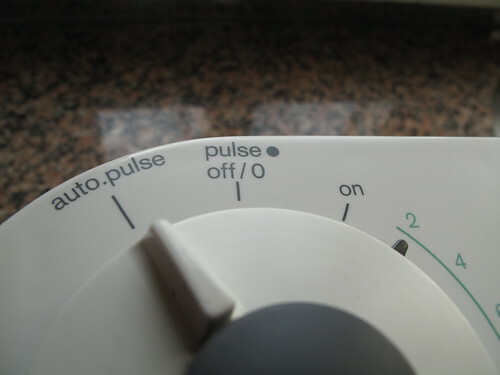 Roughly chop the fruit – skin, seeds and all in a food processor with short pulses or use a chef’s knife – Do not process to a purée. 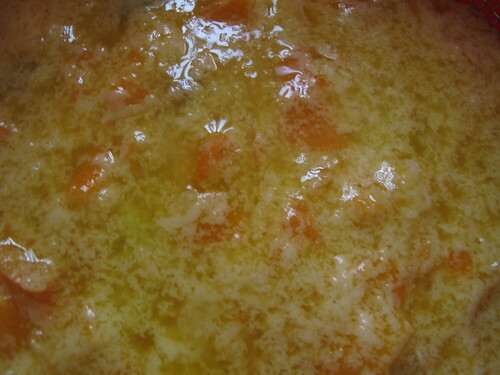 If the fruit is too finely chopped, the oil will emulsify with the pulp and not separate. 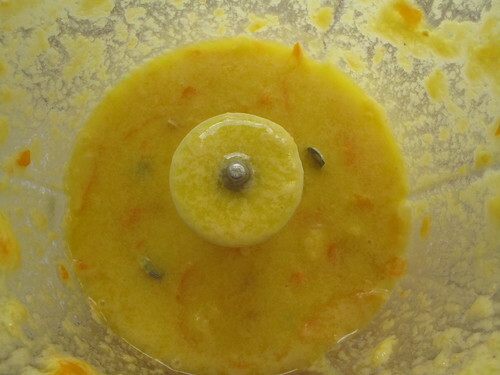 Transfer the fruit to the work bowl of an electric mixer and add the oil. Mix on low speed for 10 minutes with a paddle attachment. Whatever you do, cover tightly, refrigerate, and use within a week. 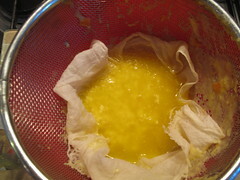 * Chef’s notes: If lemons have thick skin, the pith may add some bitterness to the oil. To avoid this, peel the zest with a vegetable peeler, put in a food processor and chop finely. Cut the pith off the fruit, being careful not to cut into the pulp. You want to save as much juice and pulp as possible. Cut the fruit into eights and process with the zest. Then put it in a stand mixer and mix as above. All of the above, and more, in one form or the other! I happen to think this is perfect for Weekend Herb Blogging #240 started by Kalyn , run by Haalo of Cook (almost) Anything at Least Once and this week hosted by Anh from Food Lover’s Journey. So, have you had any kumquat encounters? Did they end well? can be round or oval and boast yellow-gold to orange flesh.